Some 40 years ago, in ancient times of analogue cameras and film roles with a capacity of 24 pictures, Sontag already described the compulsion that humans have to photograph. As caught in a ‘sovereign power of the gaze’, our contemporary societies are fundamentally bound to the circulation of objects and technologies (Larsen 2006: 245). This results in 350 million pictures that will be uploaded on Facebook today. Over 127 billion photos will be shared on Facebook by the end of this year. From selfies taken with selfie-sticks to party-pics and millions of holiday snapshots, ‘[…]everything seems to exists to end in a photograph’ (Sontag 1973: 24). I am in San Cristóbal de Las Casas in Chiapas, Mexico, to gain insight in how identities are constructed in tourism practices and how these tourism performances produce power geometries. Research is conducted in the ‘most visited’ indigenous village northwest of the city, San Juan Chamula. On busy weekends, hundreds of tourists visit the village in the mountains. Most of them come on organized tours from San Cristóbal, to ‘experience traditional, indigenous life’, according to the brochure of a local travel agency. It is impossible to envision tourism without seeing the prominent place of the visual in this industry. Photography turns the (tourism) experience itself into a way of seeing and having an (tourism) experience becomes identical with taking a photograph of it’. (Sontag 1973: 15). According to Sontag, ‘tourism becomes a strategy to accumulate photographs in which the essence is to gaze upon the already pictorial’ (ibid: 9). This so-called tourist gaze is corporeally performed and enacted, among other by the act of photography. Gazing is a corporeal practice in where sights are interpreted and bodily (and emotionally) sensed. These individual gazes are influenced by ‘pre-constructed’ images and are always embedded in structural realities. This results in a whole range of different tourism performances at the tourism stage. The gaze is also bodily practiced through the performance of taking pictures. Bodies move into better photo-angles, they wait for other people to move out of the framed image and knees hurt from kneeling down on concrete pavements. On the other side of the lens, the subjects that are focused on are forced into particular performances. They put on their smile, hide the can of soft drink behind their backs and quickly put their arms around their children to ‘act family life’ (Larson 2005). The picture, made in a split second, freezes a whole range of consciously staged tourist performances. These picture-taking practices consume touristic sights while they produce them through the same performances. The process of making pictures is a cautious act that could be seen as a representative construction of the actor, or how the actor wants to be perceived by the audience and by the self. These 350 million uploaded pictures are ‘frozen’ performances and Facebook is one of the many stages on where identities are enacted. But the eye is not pure and innocent (Larsen 2006: 245). Eyes see the world in particular orders, shaped and classified in specific socio-cultural frames, through particular materialities. San Juan Chamula, as ‘toured’ by hundreds of tourists nowadays, is embedded in a historical context of colonialism and centuries of oppression of indigenous people and their customs. The tourist gaze is embedded in these power realities and (unconsciously) performed through these relations. Tourists and local indigenous people enact their (ethnic) identities through tourism practices, and their identities are enacted through tourism interactions. What are the photos that tourists (like to) make and could these pictures give insight in how identities are constructed and how power structures are enacted through these performances? As a methodology, interviews with tourists are structured based on their own pictures made during their tours to the indigenous villages. Questions in these photo-interviews try to elicit the informants to reflect and explain why particular pictures are taken and how they interpret the displayed images. These interviews, which are perceived as performances as well, shows how identities of others and selfs are constructed through the particular tourism practice of photo-taking. The objective of this study is to see how performances within tourism practices construct certain identities and how these performances produce power geometries. ‘I like to make photos of the children on the street because although you can definitely see they are poor they seem to be happy. We are always complaining but I realize now how good we have it back home, right? This explanation was given in an photo-interview after asking why the informant had made so many pictures of street-vending children. An explanation that gives insight in the construction of others and selfs through performances, and the power structures that are embedded in the relations that people engage in the guise of tourism. 350 Million pictures on Facebook uploaded every day made me wonder: how many young street-vendors from San Juan Chamula can be found on the Facebook profiles of tourists? Not ‘tagged’ in the picture even though they are ‘liked’ because they seem so happy? 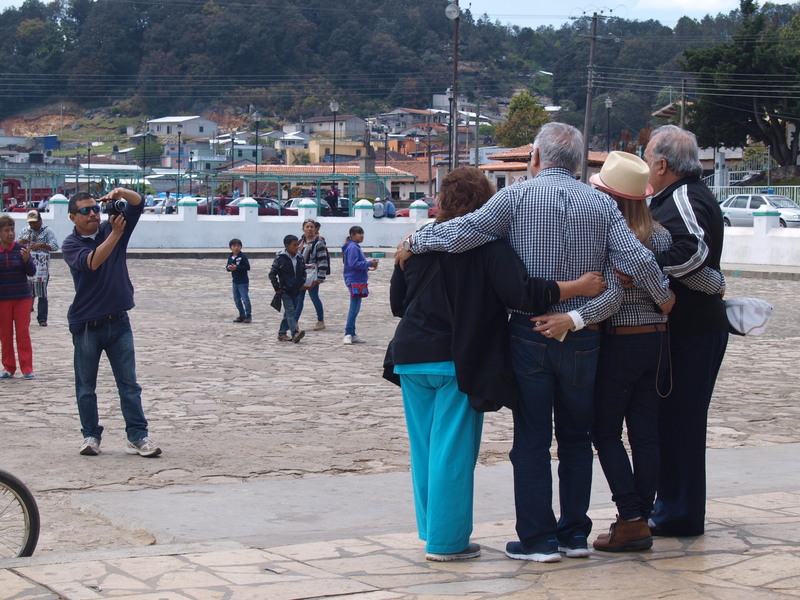 2005 Families Seen Sightseeing: Performativity of Tourist Photography. Space and Culture 8(4): 416-434. 2006 Geographies of Tourist Photography: Choreographies and Performances. 1973 On Photography. New York: Rosetta Books. This entry was posted in Education, RSO-student, Thesis and internship possibilities by Joost Jongerden. Bookmark the permalink.